Once in a lifetime opportunities come around, well, once in a lifetime. Abhishek (AJ) Ratani, Father and Husband, President and CTO @ Red Ventures, Entrepreneur, Technologist, Feminist and big Razorback fan! 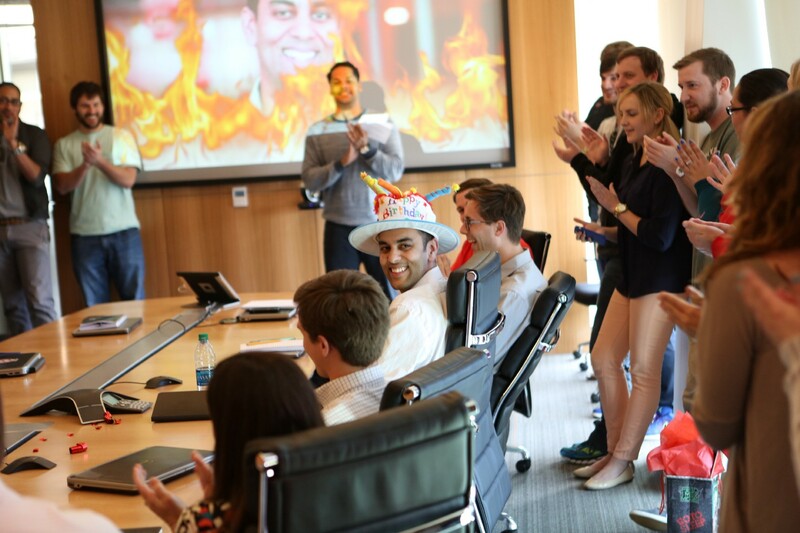 My team throwing a surprise birthday celebration and roast! Once in a lifetime opportunities come around, well, once in a lifetime. It’s impossible not to feel incredibly lucky that you happened to not only be in the right place at the right time but also that the powers that be realized they wanted you along for the ride. That is how I think about my experience with Red Ventures. So it probably doesn’t make sense to anyone reading this that I have decided to leave — something I count as one of the hardest decisions of my life. But sometimes one needs to eject from the rocketship — even when they have no idea where they are going or what they are going to do. Eleven years ago, I had recently graduated with a degree in computer science engineering. I focused on securing a position with a large tech company. Thankfully, as it turned out, those opportunities didn’t pan out. Instead, I took a job with a small Virginia contracting company in Virginia that was affiliated with NASA. It wasn’t strenuous. Because of all the red tape and bureaucracy, working for the government can be slow. Being young and hungry, it didn’t take me long to get restless, and I started looking for something different. That’s when I came upon Red Ventures, then based in Ballantyne — a borough of Charlotte, NC. When I was offered a position with the tech organization — comprising a mere 30 employees at the time — I had no idea that I had hit the veritable jackpot. Hired as the third engineer, I climbed the ranks steadily and was personally mentored by the CEO. Now, we have 3,000 employees, and I’m the Chief Technology Officer of a thriving, progressive organization. I count myself as having been seriously fortunate to be in the cockpit of a rocket ship that is on course to find a long-term home among the stars. And now, I have less than two months until I leave. Red Ventures has played a huge role in my development as a professional and as a person. It was through this company that I witnessed technology’s role not only in tracking business but in enabling it. Through Red Ventures, I acquired a rich education in technology, marketing, sales, operations, and more. What’s more is I have received unparalleled support, from the very top of the company. People believe in me — something I am so humbled by — and this inspired me to push on, do more, and be more to the company. But as I broadened my horizons and learned the end-to-end facets of business, I also felt an entrepreneurial “itch” start to pester me: What would it be like to launch my own business? My dad owns a small business, and I witnessed his endeavors as I was growing up. That’s probably where the entrepreneurship bug first bit me. The mystique of being self-employed was always present. The concept intrigued me then — and still does. I suppose that inner desire — to do something on my own — is what is driving me now. It seems counterintuitive to leave a secure position with a growing company that can offer me every opportunity I could possibly want, but I know this next step will define me further — as a professional, an explorer, a husband, and a father. I need to take a risk, break the rules, and, yes, expose myself to the potential of failing. Throughout my career, I have mostly operated from a place of comfort. Red Ventures has been safe. Yes, there have been ups and downs; I have experienced some failure. But all in all, I have been protected. Now, I’m simply curious to find out what it’s like to operate without a safety net. I started discussing this idea with my wife about four years ago. We knew I could continue having a great career at Red Ventures: I could wait and save more money, get a bigger safety net, and just give it a bit more time. But during our conversations, we realized that there’s never a good time to do something like this — that you can always come up with a reason to delay it. We decided to pull the trigger, and I truly appreciate her support and counsel. Less than two years ago, I made my thoughts public to my CEO. Let me tell you that wasn’t an easy conversation. We had several discussions following that, and I appreciate that he eventually understood where I was coming from. We also agreed to a two-year exit plan. Why did I give so much notice? This company has been so good to me, and I wanted to make sure that my team was in a good place, the right replacement is hired, and we were setup to take advantage of the opportunities this company has for the long-term. I broke this news to my team a few months ago, and that was the hardest conversation that I ever had at work. It was hard because we have some great projects going on right now and I personally have some very important relationships with the people who work with me. And I am so grateful about what we have been able to accomplish together! I know I am going to miss Red Ventures, and there will never be a time when I am not forever grateful for the opportunities that have been offered to me and the people I have worked and collaborated with. The future is not going to easy, but I am excited to embark on this journey and find out what’s next. I have a feeling it might be worth it. Abhishek (AJ) Ratani is President of RV Technology and CTO at Charlotte-based Red Ventures. Red Ventures is a technology-driven customer acquisition company that has grown significantly over the last 10-years. AJ has held various roles within the organization, starting as an Engineer 10-years ago and growing within the organization to run Red Ventures largest and fastest-growing businesses. AJ’s other passions range from being an investor in great ideas, finding ways to help other entrepreneurs succeed, and being a voice for woman’s equality and empowerment in the workplace. The views and opinions expressed in this article are those of the author only.